TAIPEI (Reuters) - Taiwan Semiconductor Manufacturing Co (TSMC) <2330.TW> offered a modest fourth-quarter revenue growth outlook, predicting weaker sales of high-performance computers for cryptocurrency mining will partially offset solid demand for chips from smartphones. 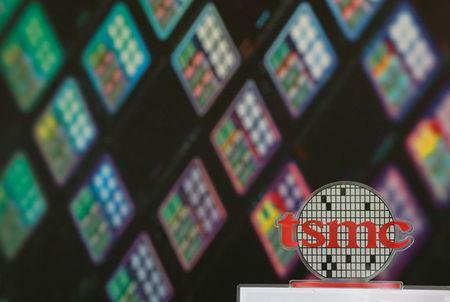 TSMC , the world's largest contract chipmaker whose clients include iPhone maker Apple , also shrugged off concerns over Sino-U.S. trade tensions hurting its sales, betting investment in advanced chipmaking technology will help cushion the impact. In a move likely to further consolidate TSMC's technological leadership, key rival GlobalFoundries said recently that it would not compete in the latest generation of chipmaking technology that is hotly sought after by high-end device makers. "Despite the current market uncertainties, our business will benefit from a continued steep ramp (up) of 7 nanometre for several high-end smartphones," Chief Financial Officer Lora Ho told the company's earnings conference. "However this will be partially offset by continued weakness in cryptocurrency mining demand and inventory management by customers," she said. Analysts said solid demand for Apple's new iPhone models, estimated from contract electronics maker Foxconn's revenues for September, will also support TSMC's growth in the fourth quarter, a crucial year-end holiday season for smartphone makers. Revenue rose 1.9 percent to $8.49 billion, higher than the company's own estimate of $8.28 billion-$8.38 billion, as well as the average $8.4 billion estimate of 25 analysts, according to Refinitiv data. The results came after semiconductor industry bellwether ASML Holding NV , a supplier to TSMC, posted better-than-expected third quarter results and gave a bullish outlook on Wednesday, helping assuage fears of slackening demand. Shares of TSMC, which rivals Intel Corp as the world's biggest semiconductor firm by market value, closed down 0.8 percent at T$236.50 on Thursday ahead of the financial results, compared with a 0.3 percent fall for the benchmark index <.TWII>.